At birth, we have about 15,000 little hair cells in each of our ears that allow us to hear. By the time we’re in our 70’s and 80’s, many of those hairs have died, with no method of regeneration. 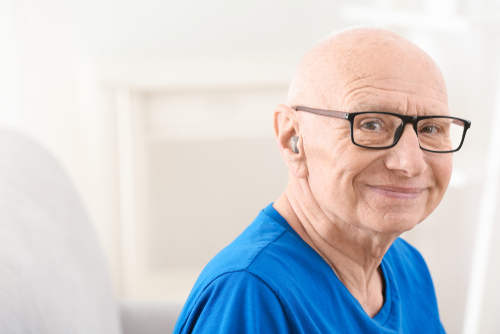 Though there is some promising research out there about regrowing these hairs in the future, you need to communicate with your hearing impaired loved one today! Here are a few ways that you can make that connection effectively. Though your loved one may not be able to learn the entirety of American Sign Language, a few simple phrases can help close the gaps of interpersonal connection. When combined with the little they can hear, lip reading, and other gestures, a few dedicated ASL words will help them express themselves. After all, without adequate forms of expression, your loved one may feel isolated and depressed. By giving them the tools they need to communicate, you can restore their agency. When you approach someone who can hear clearly, unless you are particularly sneaky, they will notice your approach before you arrive. However, if your loved one cannot hear well, you may frighten them if you approach them outside of their line of sight. So, when you approach your loved one, make sure they can see you. Though this may seem simple, it can make a big difference for them. When you are communicating with them, make sure to stay visible so that they can use their lip reading skills to supplement what little they can hear. Don’t change the way you speak to accommodate this. Lip reading is best done when the person speaking is doing so naturally. There are a ton of great apps and technological devices that you can use to help your hearing impaired loved one communicate with you. Live Caption, for example, will transcribe your face-to-face conversation so that your loved one can read along and respond. There are even apps that transcribe phone conversations for the hearing impaired. If your loved one needs to transition into an assisted living home, then Kenwood Care is ready to accommodate them. Our community provides around the clock care with one of the lowest resident-to-caregiver ratios in the state. We also offer excellent medical care and work with Alzheimer’s specialists to ensure that your loved one is receiving everything they need to live life to the fullest. To learn more about our communities, contact us today.